What is multichannel ticketing system? On an ideal day, your agent simply works and solves a question or a support request they receive from a customer. On most days though, it's rather chaotic for agents, receiving mounds of tickets from multiple customers, from various channels. An effective helpdesk ticketing software ensures that this process goes smoothly, stays error-free, and makes customer service easy for everyone involved. "According to a 2013 Forrester report, 42% of service agents are unable to efficiently resolve customer issues due to disconnected systems, archaic user interfaces, and multiple applications." Email : All your customer emails get pulled into a convenient interface where you can easily respond to them. This is the best way to handle customer service emails, even when you use several email addresses. Social media : You can view and manage your customer's communication via social media like Facebook and Twitter. 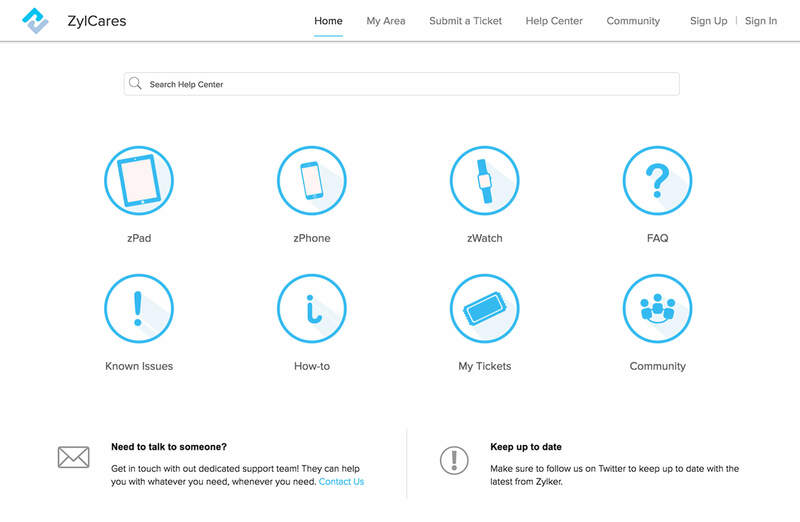 You can reply to tweets and posts from your help desk and even set keyword alerts. Learn more. 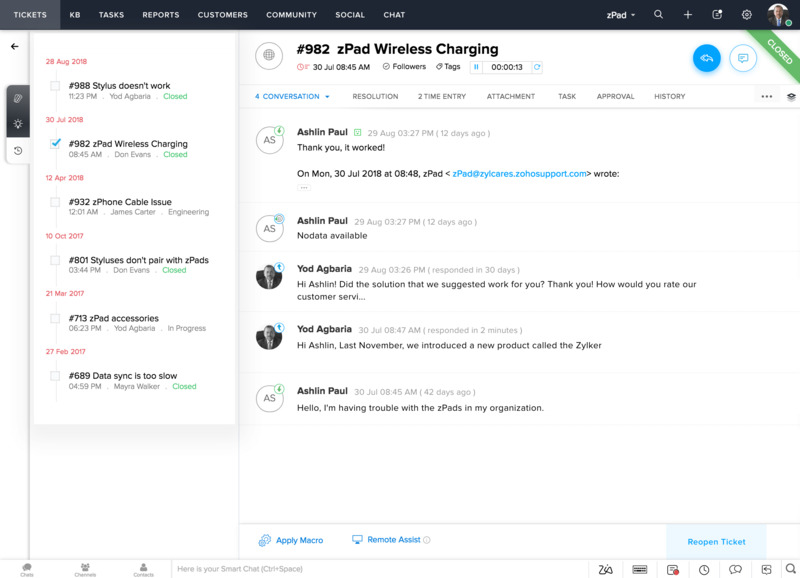 Live chat : You can chat with customers to understand their concerns better, and give them more timely, personalized help. Ticketing system software helps you convert chats into tickets if the issue needs more detailed attention. Learn more. Telephony : Effective ticketing tools allow you to use cloud telephony. 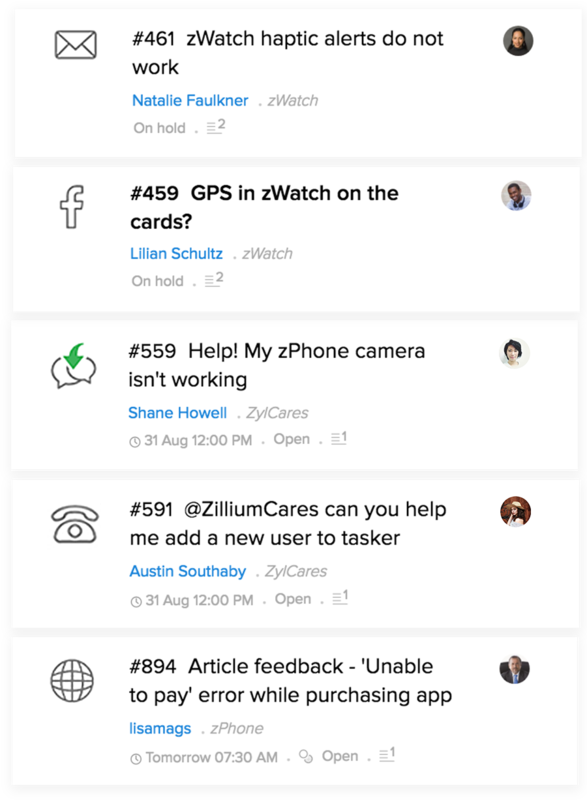 Receive and make phone calls from within the help desk. Log, record and monitor these calls, and convert them into tickets or associate them with existing ones. Learn more. Web form : Embed a customizable web-form widget on your website that will help your customers fill out a form with the details you need and submit their questions as tickets. Asking a customer to introduce themselves repeatedly will frustrate them and waste a lot of time. The customer service process is a lot easier when the agents can see the customer's previous tickets raised with the company from any channel, along with their latest ticket. Empowered with this context, they can solve customer issues better and faster. Apart from streamlining customer conversations, it's also important to have the time needed to build customer relationships. But that's difficult to do when there are too many tickets to rush through, and some may need more attention than others. The best solution? Let your customers find answers themselves. "According to Forrester, 67% of consumers used web self-service knowledge to find answers to their questions." 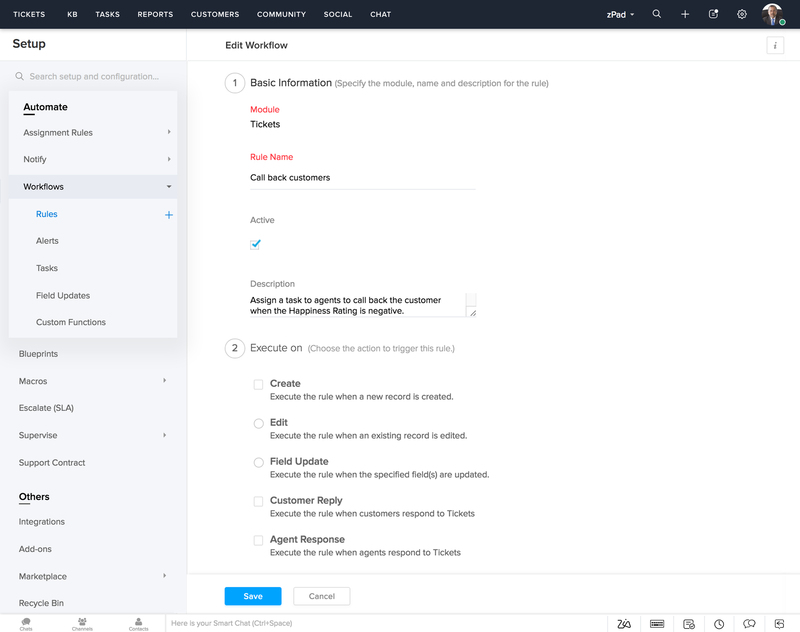 With a proper trouble ticketing system, you can create your own multibrand Help Center, complete with a Knowledge Base, a repository of articles and FAQs, where customers can simply search and find answers to their questions. Learn more. You can increase customer engagement by setting up communities and forums where they can interact with each other and discuss common questions. If your customers aren't happy with any of the articles in the KB, they can instantly get in touch with an agent via live chat. The agents can quickly talk and resolve the issue without having them submit a form. Handling tickets is easier when agents know who's handling what. With clever automations, your customer service can run smoothly. You can set up different SLAs and Workflow rules for each channel, and make sure customers get resolutions on time. Apart from this, you can also set Assignment rules to ensure that tickets from a particular channel get assigned to the right agent. Learn more. When you have a multichannel helpdesk ticketing system, you can measure how much your customer service has improved and how happy your customers are. Details like which channel has the highest ticket traffic and typical resolution time for tickets under each channel will help you find bottlenecks and resolve them quickly. Certain ticketing tools also let you create customer reports and dashboards, then schedule and export them. Learn more. Ticket management system enables you to integrate with apps that are useful for your business, and customize according to your brand guidelines. This helps you get familiar with the software much faster. Integrating CRM, inventory, and invoicing software with the help desk along with APIs, will also help you manage multiple apps from one interface. Learn more. Which ticketing system should you buy? 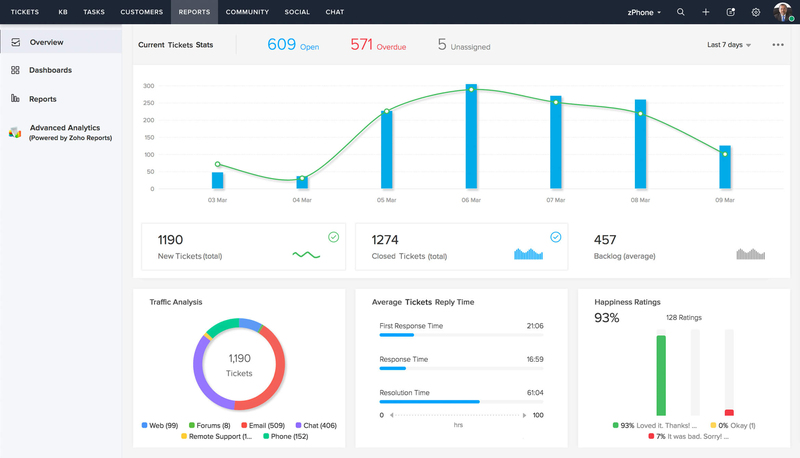 There are a lot of options to choose from when it comes to ticketing software, and almost all of them come with a free trial period, including Zoho Desk, one of the industry's leading ticketing system solutions, which helps you put customer service at the heart of your business. You can evaluate and compare Zoho Desk with its contemporaries, take a look at pricing plans, and arrive at a decision yourself. No matter how many brands your company consists of, you can create and maintain distinct help centers—knowledge base, FAQs and communities—for each brand. Your customers can experience each brand, while you manage them all from a central spot. With the ability to create as many departments as you need, replicating your organization in Zoho Desk is easier than ever. You can organize your customer service efforts within Zoho Desk just the way you need.